Label Paster and Laminators for everything from a small label to large posters. Increase production and through put rates with these high quality industrial grade machines. People ask which is the best machine without giving us any details. We will ask a number of questions to help guide you to the best solution. Some of the questions involve what you are gluing, what kind of adhesive you are using, the size piece (we need to know the widest piece you will apply glue to determined by of the smaller of two dimensions length and width), the thickness being glued, and the number per day or shift. Each Potdevin machine has a strong characteristic. Potdevin Large NTZ cold glue Label Paster with the Accumount Table and Rotary Press. Labeling equipment for almost every type of application from table top up. Click on the link to get more information about each machine. Automatic/Semi-automatic Label Paster - For applications requiring hands free label feeding. Same basic unit as the LM series with feeder. Three sizes available 6", 8 1/2", and 12" widths. Edge Gluer - For placing glue along the edge of the material. Available in widths from 1" up to 15". Email your requirement for more information. Glue - Liquid glue for label applications. Heavy Duty Label Gluer - Model 10A and 10F. 12" & 18" hand and motor units. LH Label Pasters - Manual crank handle type table top unit. Three sizes available 6", 8 1/2", and 12" widths. LM Label Pasters - The old standard for applying labels from a table top unit. Three sizes available 6", 8 1/2", and 12" widths. LP Label Pasters - Modernized label gluer. Three sizes available 6", 8 1/2", and 12" widths. NTZ Gluer - Heavy duty, large label applications. For the BIG jobs. Four sizes available 27", 32", 36 and 42" widths. Release Cote- Paste type material when applied to glue tanks will make clean up a breeze. Available in quarts, gallons, 5-gallon pails, and 55 gallon drums. 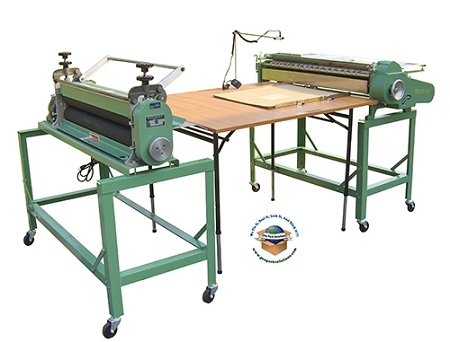 Rotary Press- Used in conjunction with the NTZ and Type Z gluers. E-mail for information. Potdevin recommends choosing a larger press than your gluer. Type 2R Gluer - Compact, ruggedly constructed gluer with roller glue applicator. Available in models from 9" up to 21". Type Z Gluer- Label Pasters up to 60" in width! Call for details and a quote. Accumount Table - Adjustable table with emitting cross hairs for accurate placement of poster to substrate. Click here for the Potdevin brochure on many of the pasters in pdf format. Potdevin Machine Company, a vendor of ours for over 25 years, has only one flaw: They last too long!